I saw this article on Eric Cressey’s newest blog post, “Strength and Conditioning Stuff You Should Read: 3/12/13“. Eric says in his post that, “I thought Patrick Ward did an excellent job writing up this post, which features a review of a recent study performed on the efficacy of Crossfit.” I agree with Eric and Patrick on this one. It’s a good read and gives more in-depth information and ideas than that of my blog post – I’m still trying to get the blog writing thing down. If you haven’t read my blog post on my thoughts on Crossfit, check it out here. Anyways, I’ll let you, the reader, decide on what you think about Crossfit. 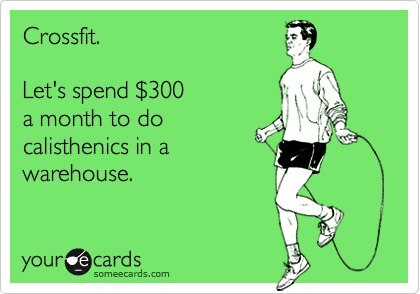 Patrick, Eric’s and my thoughts on Crossfit are our opinions, NOT fact. I know there are some Crossfitters out there that are probably shaking their fists at their computer screen in anger, but it’s our opinion after all. Respect that.